As by-elections go, the one in the provincial riding of Sudbury in Ontario has been pretty dramatic. Accusations of skulduggery, a Liberal-turned-independent candidate mixing it up, and a floor-crosser that managed to ford both the ideological gap between two parties as well as the federal/provincial line. Some of the polls have been showing a close race between Liberal candidate Glenn Thibeault and the NDP's Suzanne Shawbonquit, with independent Andrew Olivier earning a big chunk of the vote. Other polls have shown Thibeault with a relatively comfortable lead. What gives? At first glance, it is very puzzling that the polls by Forum Research and Oraclepoll Research can differ so much. Both firms have been in the field twice at exactly the same time. 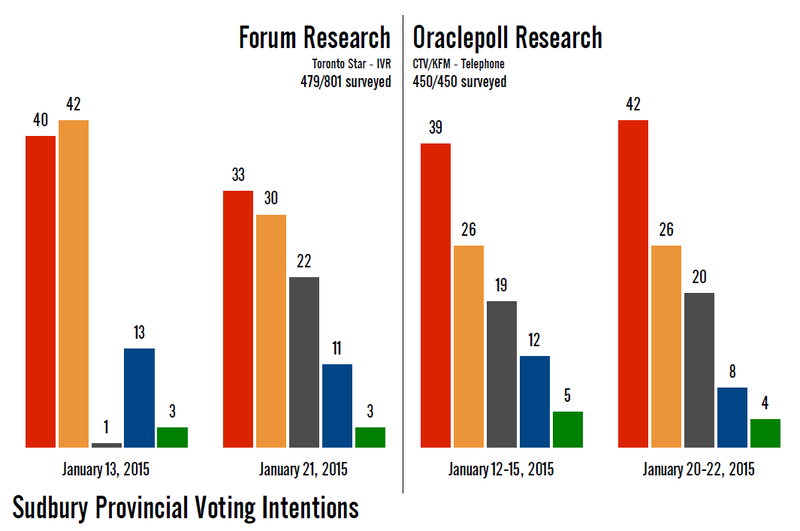 Oraclepoll was in for three to four days, with the Forum polls right in the middle of those sampling periods. So timing should have nothing to do with it. Forum's first poll on January 13 put the gap at just two points, with Shawbonquit narrowly ahead. Olivier scored just 1%. Then on January 21, the gap was three points for Thibeault as he dropped seven points and Shawbonquit fell 12. Olivier made a miraculous 21-point gain, which Forum called a surge. Meanwhile, Oraclepoll gave Thibeault a lead of 13 points on January 12-15 at 39% to 26% for Shawbonquit, with Olivier at 19%. On January 20-22, the gap was 16 points (42% to 26%), with Olivier at 20%. In other words, while Forum was showing a major shift, Oraclepoll was showing stability. There are many reasons to trust Oraclepoll's numbers more than Forum's. Here's why. Firstly, Forum is based out of Toronto and Oraclepoll is based out of Sudbury. Right out of the gate, the local firm has an advantage both in terms of local knowledge and a local area code showing up on the caller ID. Secondly, and most importantly, Oraclepoll is conducting a superior survey. Forum is doing its polls via IVR, as it always does. It jumps into the field for a few hours on one evening, gathers its 500 to 800 responses, and reports the numbers a day or two later (response rates being what they are for Forum, it probably needs to call 25,000 to 80,000 households to get even those small samples). Though it doesn't say explicitly, we can assume that Forum is not calling cell phones. This is because, unlike land lines, it is not possible to know for certain where a respondent on a cell phone is living. This is a problem in by-elections, as ridings do not entirely occupy an area code. This is not an issue in provincial or national polling. Cell phones can be included there without issue, and usually are. Update: Commenter DL (see below) points out that targeting cell phones in a billing area is straight-forward, so Forum may indeed be calling cell phones. The inability to call cell phones pinpointed to a specific riding would be more of a problem in a city like Toronto where there are multiple ridings within one municipality. Oraclepoll, on the other hand, is doing its polls with live-callers and it explicitly says that it is including cell phones in its sample (perhaps it has a list of local cell phones to call from). It is also in the field for several days, and according to its press release is calling back numbers where respondents did not answer up to five times before giving up. That is how a poll is supposed to be done. Forum is getting responses from whoever is home between, say, 7 PM and 9 PM on January 13 and January 21 and is willing to answer a survey. Oraclepoll is doing everything that is reasonably possible to reach everyone it is calling. The potential for a biased sample is far lower. Lastly, Forum's 1% result for Olivier on January 13 defies logic. At the time the poll was released, people were very surprised that Olivier, who had a relatively high profile, was scoring just 1%. That his number jumped from 1% to 22% in eight days makes little sense, particularly when Oraclepoll was showing his support levels to be steady at between 19% and 20% over the same period. While it is conceivable that the discrepancies in the results for the Liberals and NDP can be explained away by sampling issues and statistical probability, the discrepancy for Olivier's numbers are virtually impossible. I don't know what happened in Forum's January 13th poll. But it simply doesn't make sense. In that survey, Forum inquired as to whether Sudburians (Sudburites? Sudburers?) approved of the candidates on offer. The responses there just don't line up with the voting intentions numbers it recorded. At the time, the poll found that 95% of respondents were aware or had an opinion of Thibeault, compared to 75% for PC candidate Paula Peroni and just 61% for Shawbonquit. But Olivier, who had just 1% support in the same poll, had 88% recognition - better than either the NDP or PC candidates. That poll also suggested that 48% of all respondents (including undecideds and those who did not know him) approved of Thibeault, indicating that he was converting about 80% of sympathizers into supporters. Shawbonquit, with 41% approval, was converting an incredible 99% of sympathizers. Peroni's approval was just 28%, as she was unknown to many respondents, but she was converting just 45% of sympathizers into supporters. Olivier, though, had an approval rating of 60% of all of those sampled - and this is including those who did not have an opinion or did not know him. That was higher than any other candidate. According to the poll, we are thus supposed to believe that Olivier was converting just 2% of his sympathizers into supporters. If you can believe that, I have a bridge that spans the width of Lake Huron to sell you. I think we can reasonably conclude that the January 13 poll by Forum can be tossed aside and discarded. Forum's January 21 poll has no similar problems, and support levels for Olivier and Peroni are similar to those recorded by Oraclepoll. Considering the sample sizes, Shawbonquit's support is also within the margin of error of these two polls, and Thibeault's is only slightly outside of it. Due to the advantages that Oraclepoll's survey has over Forum's (not to mention the poor record Forum has in by-elections outside of Toronto), the benefit of the doubt should probably go to Oraclepoll. And that's even with the smaller sample size (the margin of error of decided voters would be just under +/- 6%). If we use that margin of error to estimate support ranges, we'd get Thibeault at between 36% and 47%, Shawbonquit at between 21% and 31%, Olivier between 16% and 25%, and Peroni between 5% and 11%. That is probably as close as we can get to the truth at this stage of the campaign, which will come to a merciful end on Thursday. The current federal projection puts both the Liberals and Conservatives in range of winning a plurality of seats, but neither appears capable to assemble the numbers for a majority government at this point. Let's take a closer look at this. First, though, I invite you to check out my article today for the CBC. I've delved more deeply into the numbers for British Columbia, an interesting three-way race with multiple sub-regional contests, and Alberta, where some surprises could be in store for 2015. Despite being behind in the vote projection by 1.3 points, the Conservatives are currently being awarded 136 seats. That puts them 34 seats short of an outright majority (169 seats is the threshold for 50%, but unless a sitting government wants to have the Speaker be from one of the opposition parties, 170 seats are needed). If we look more broadly at the likely ranges, the Conservatives have between 117 and 155 seats. That still puts them 15 short of a majority government, a big gap to overcome. The polls would need to be off by a fair bit, and a lot of the close races would have to fall in their favour, for a majority government to be won at this stage of the game. The chart on the left breaks down the Conservative ranges over the last three weeks. I've removed the Liberals and NDP ranges for clarity. Below I've done the same for the Liberal and NDP numbers. If we extend things even further to the maximum ranges, the Conservatives are in play in 189 seats. That gives them a cushion of 19 for a majority government, but would require the polls to be significantly off the mark. The maximum projection, for instance, is based on national support of just over 41%. The Conservatives' hopes of a majority government really come down to Ontario and British Columbia. Even in the best of circumstances, where the party takes 41% of the vote, their seat total would only be increased by 16 outside of these two provinces. That isn't enough. Instead, it is British Columbia, where they could boost their haul by nine seats, and particularly Ontario, where they could take 24 more seats, where a majority government will be won or lost. However, that is not the situation the party currently finds itself in, well short of a majority and neck-and-neck with the Liberals in the seat ranges. Even if the party does manage to end up at the high end of their current range, or 155 seats, the Liberals and New Democrats would likely end up with a majority between them. Would a Conservative minority government really last very long? The Liberals, currently at 126, are well short of a majority and are even short of the Conservatives for a plurality. But their likely range puts them between 107 and 144 seats, and so capable of placing first in the seat count. A majority government does not appear in the cards at the moment - the maximum for the party is 165, five short of the mark. For the Liberals, whether they end up on the high end of the range depends almost entirely on Ontario and Quebec. They are currently close to their maximum in British Columbia, Alberta, the Prairies, and Atlantic Canada. Even if the party ends up at the maximum range of their likely support, they can only pick-up six extra seats in these regions. These regions are actually more in danger of being disappointing. If things go badly, they could finish with 18 fewer seats in these regions than they are currently slated to take. Ontario is the big prize, though, with the current range being between 45 and 63 seats. That accounts for roughly half of their national range. There is slightly less potential for a breakthrough in Quebec, but it is nevertheless important as the party currently sits at between 20 and 30 seats there. The maximum goes up to 35. What this means is that if the Liberals are slightly under-performing in Ontario and Quebec, they cannot make up those losses with better performances in the rest of the country. Their election chances live and die in Ontario and Quebec. For the New Democrats, placing first or second is currently not envisioned. Their overall take is slated at 72 seats at the moment. While that is down 31 seats from what they managed in 2011, it would still rank as their second-best performance in party history. But their sights are set higher than that. The ranges suggest the party is unlikely to return to pre-2011 levels, with between 54 and 87 seats. The lower end of the scale, however, would lead to more gains for the Bloc Québécois. This has the potential to complicate the arithmetic in a minority legislature. With the Bloc at a half-dozen seats or less, the NDP and Liberals can form a majority on their own. Once the party starts creeping closer to 10 seats, that becomes less likely. And the only route for a stronger Bloc is through the NDP. The maximum ranges for the party do suggest it could end up with as few as 30 seats, but that assumes a major collapse, particularly in Quebec. Their higher range of 109 seats is more interesting, as it would likely lead them to finishing second in the seat count. Though the NDP's highest range is higher than the lowest range for the Liberals and Conservatives, it is not conceivable that all three can occur at the same time. If the NDP is as high as 26%, for instance, the Liberals are likely down quite a bit - which means the Conservatives win more seats. At this stage, an outright NDP victory does not seem plausible. Quebec really is where everything will be decided for the NDP. Stronger performances outside of the province would only add six seats to the current projection of 72. A strong performance in Quebec could add nine seats alone (or 16 if things go very well). A poor performance in Quebec could drop the party by nine seats. A really bad performance could drop them by 22. Ontario is also important for the NDP, but more in terms of avoiding a serious drop in seats. They are considered to be in play in just 18 ridings there at the moment, but could drop to eight with even a slight under-performance. Ontario is more about salvaging things for the NDP than making gains. That about sums up the lay of the land at this point, with the likely ranges serving as a good guide to where things could potentially go in the coming months if no major shifts take place. The maximum ranges tell us what could happen if those major shifts take place. If that happens, of course, the numbers will be re-calculated to see where things could go from that new vantage point. It will be an interesting year. It is hard to believe that 2015 is now finally upon us. The 2011 federal election seems like eons ago. At the time, the prospect of a majority government, after seven years in which four elections were held, seemed like an endless expanse. But we're now finally in the election year, so it is time to get ThreeHundredEight.com's projection model up and running. I'll get into analyzing the numbers themselves in the coming days. For now, you can click on the link above or the table above to see the breakdown. For now, let me go over the features of the model, the changes that have been made, and how we got here. The roots of the model that will be used for the 2015 federal election, and which has been used in 12 provincial elections that have occurred from coast-to-coast, was first employed in the 2011 federal vote. In some ways, that election was a successful proof of concept. In other ways, it was a failure. Those who doubt the usefulness of projection models and other critics will undoubtedly point to that failure in 2011. They would not be wrong in doing so, but it would be dishonest. Why? Because the projection model worked very well in 2011. The model would have missed the Conservative count by just five seats, and pegged the Liberals and New Democrats to within three. Even the huge breakthrough in Quebec for the NDP would not have thrown the model for a loop - the New Democrats would have been awarded 60 seats and the Bloc Québécois just four (the actual result was 59 and four, respectively). So the seat projection model proved its ability to translate regional support levels into accurate numbers of seats. This has been proven again and again in provincial elections since. But the call in 2011 was nevertheless missed. There were two reasons for that. The first was entirely my fault. At the time, I had been basing my model on past elections like those in 2006 and 2008. In each of those elections, the polls in the last weeks of the campaign hardly budged. The swing that occurred over the holidays in 2005-2006 had settled in for some time by the end of that campaign. With those elections as my guide, I calculated that I needed to decay the weight of a poll by just 7% with each passing day. That was a grave error. It is a system that would have worked well in 2006 or 2008, but utterly failed to capture the late swing away from the Liberals and towards the New Democrats that occurred in 2011. What happened was that, by election day, the projection model was still roughly one week behind where it should have been. Accordingly, it projected a Conservative minority government with 78 seats going to the NDP, 60 to the Liberals, and 27 to the Bloc. After that disaster, I changed the way the weighting system worked and increased the decay to 35% per day. This has been employed in the past dozen election campaigns and has had no trouble capturing the shifting mood of the public. But that is, of course, if the polls capture it as well. And that is the second reason why 2011 did not go well. The polls did a moderately good job of things in 2011. They were on the money in Quebec, where the electorate had shifted so dramatically. But at the national level, the polls missed out on the Conservative majority government. With the system in place now, the vote projection model would have given the Conservatives 36% of the vote, instead of the 39.6% they actually got. Both the NDP (31.5% instead of 30.6%) and the Liberals (20.1% instead of 18.9%) would have been over-estimated. 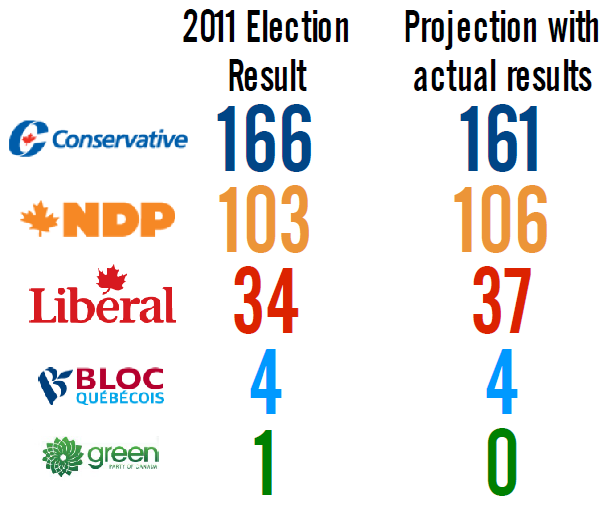 The seat projection would have put the Conservatives about a dozen seats shy of a majority government. This is why, starting with the 2012 Alberta provincial election, I developed a system to estimate likely ranges of support. This system takes into account the potential for the polls to be wrong, and is reflected in the table at the top of the page by the low/high and minimum/maximum ranges. Nineteen times out of 20, the result should fall within the maximum/minimum ranges. There are varying levels of likelihood of the results falling within the other ranges, as explained on the methodological page. These ranges allowed me to be one of the only people to consider the possibility that Wildrose would not win that 2012 vote. Starting in 2013, I added another element to the projection model. I found that, too often, people were taking the projected results in individual ridings too literally, as if they were a real indication of support. For that reason I have long thought about not publishing riding projections. But I think it is important to 'show my work', and that is what the riding projections do. They also include ranges that should give people a decent idea of who is and who isn't in play in a given riding. Still, I wanted to make sure people considered the potential for error. I added probabilities to the projection model, measuring the likelihood that the call the projection model makes in each individual riding will be right. To take London North Centre, where the Liberals held their two-day caucus meeting last week, as an example, the model currently says that the Liberals would win it with between 43% and 50% of the vote. The Conservatives, at 29% to 34%, are apparently not in play. But the model also says that the Liberals have an 82% chance of winning it. That means that, despite the ranges projected by the model, there is still a roughly 1-in-5 chance that the Liberals will not win the riding. These probabilities were the last major addition made to the basic projection model, which has been employed with very few changes in the most recent provincial elections in British Columbia, Nova Scotia, Quebec, Ontario, and New Brunswick. A few new minor features, however, have been added for 2015. While none of the basic mechanisms of the model have changed (see the methodological page for complete details on how it works), there are some differences between the 2015 model and the model that was used in prior elections. First is something that is gone. In past elections, I've applied a "floor-crosser" factor in ridings where a sitting MP has crossed the floor to run with another party. It has had a mixed record. In some cases, the "floor-crosser" factor was quite effective. In others, it was greatly off the mark. I have decided to drop it as a factor that is taken into account. In its place, the party losing a floor-crosser suffers a 'no incumbent' penalty, and the party picking up the floor-crosser gets a 'star candidate' bonus. In past elections, this would have worked better than the system that had been used. A new factor that has been added to the model, however, takes into account party leaders. My research has suggested that leaders are far more difficult to defeat than normal incumbents (though it can always still happen, of course) and that an MP running as a leader for the first time perform especially better than other incumbents. The loss of a leader as a candidate in a given riding, in addition, is far more penalizing than the loss of the average MP. So, for example, Gilles Duceppe's old riding will be harder to win back for the Bloc Québécois than the average riding they lost in 2011. As always, an election has its own particularities that need to be taken into account. The idea behind the projection model is that it can be applied uniformly in all jurisdictions in Canada. But the fact is there are always oddities in individual elections that have to be considered. The new federal riding boundaries is one thing that will make the election potentially harder to call than would have otherwise been the case. But the model has dealt with new boundaries before. In the 2011 Manitoba provincial election, for example, 56 of 57 ridings were called correctly despite the shifting boundaries. For this election, the model merely uses the transposed results that were calculated by Elections Canada. 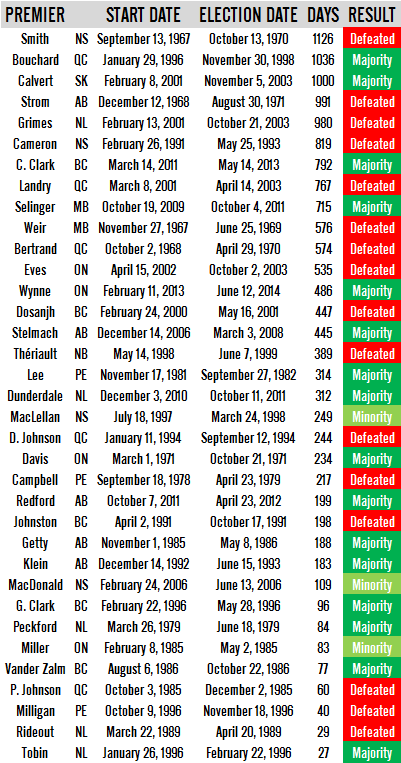 MPs that have shifted ridings are treated as incumbents. Ridings with no incumbents are left unadjusted by the incumbency factor. The presence of Forces et Démocratie complicates matters. Normally, new parties have been handled by the model without much difficulty. Their support is awarded equally in all ridings within a given region (with the correct regional results, the model would have been within one seat of Wildrose's result in 2012, despite the party fielding candidates for the first time in many ridings). But no pollster has included FeD in its surveys yet, so we cannot gauge their support. What I have done, until better data becomes available, is to treat Jean-François Larose in Repentigny as I would any sitting MP running as an independent (he retains a portion of his 2011 vote). For Jean-François Fortin, I have simply decided to adjust his 2011 support levels with the Bloc exactly as Jean-Martin Aussant's PQ support in the 2012 election shifted when he led Option Nationale. He seems like an appropriate example to use as a guide. The floor-crossing of Bruce Hyer from the NDP to the Greens (via a stint as an independent) is also hard to model. Floor-crossing between the 'establishment' parties is relatively straight forward. Not so when it is the Greens, because their base in Hyer's riding was so small in 2011. Treating him like any other floor-crosser would, I think, under-state his likely support. What I've done for him, then, is to adjust his support levels in the same way that Blair Wilson's support shifted when he crossed to the Greens before the 2008 election. Hopefully a riding poll will be done in the riding to give us a better idea of what is going on, as I fear the system in place is also inadequate. The last particularity of the 2015 election is the presence of an independent candidate like Inky Mark. In 2011, the model did not make any adjustments for the independent candidacy of Hec Clouthier, a former Liberal MP, in Renfrew-Nipissing-Pembroke, who captured a respectable share of the vote. Mark used to be an MP for the riding of Dauphin-Swan River-Marquette (now known as Dauphin-Swan River-Neepawa) and is running as an independent. So, based on past cases of former MPs attempting a comeback as an independent, Mark has been awarded a portion of the support he had in the last election. As always, I urge readers to exercise caution when looking at the projections. Consider the ranges very carefully. Don't take the individual riding projections as fact. The model simply cannot take into account the effects of local issues in all 338 ridings, and some will be wrong. Take, for example, the riding of Outremont. It is currently projected to go Liberal, with the NDP in range of winning it. That is Thomas Mulcair's riding. Do I think he is actually going to lose it? Not for a second. But the model does, simply because of the gains the Liberals have made province wide in Quebec. And that brings up something I am concerned about in the 2015 election. Polls have shown strong gains for the Liberals in Quebec. They have roughly doubled their support in the province since 2011. The model, then, doubles their support in every riding. That means the party is in a good position to sweep Montreal, where they had a decent base in 2011. But regional polling by CROP has shown disproportionate growth for the Liberals outside of Montreal, meaning that the model may be inflating the party's numbers too much in Montreal and not enough outside of it. This is why, for example, it could be very wrong about Outremont. The overall seat count for the province, however, is likely to be accurate. Using the polls from CROP, I made projections for the province at the sub-regional level. The end result was not much different. At the riding level, there would be some important differences - more Liberal wins outside of Montreal, fewer around the city. But the sum total of the seat count remains the same - particularly when we consider the ranges. This is why I beg readers not to miss the forest for the trees. The individual riding calls are not nearly as important as the overall regional and national projections. You might wonder why I don't adjust the model to project sub-regionally in Quebec. The issue with that is that no other pollster is releasing sub-regional numbers for the province. And in 2011, CROP exited the field over a week before the end of the campaign. It would seem unwise to turn the Quebec portion of the model into a sub-regional one, when in all likelihood I won't have information to plug into it. That about covers everything. I reserve the right to make some adjustments between now and the start of the campaign, though I don't suspect anything but tiny tweaks (perhaps to the values of the 'factors', for example, if I have time to plug some more data points into my calculations). If you notice anything that looks fishy, or even typos, please do alert me to them as errors could have crept in. Though the model is fully automated, the graphics aren't. They can take quite some time to pull together, so at this stage I'm not sure how frequently I will update the projection. At least weekly, certainly, but updates with every individual poll, as I was doing for the running poll averages, may be too much. And just to make things clear: no, I am not changing the name of the site to ThreeThirtyEight or some variant of that. Consider the name of the site as a historical monument to when it was launched, during an era of seemingly endless minority governments. Are we heading back to that this year? The current projection, with the Conservatives at between 117 and 155 seats and the Liberals between 107 and 144, would seem to say yes. But more on that later this week. Trawling through the archives, I came across a compilation of approval ratings polling by Environics, stretching from 1985 to 2009. Something like that is just too interesting not to share. The polls show some pretty clear patterns, at least after the tumultuous tenure of Brian Mulroney. Canadians have tended to be pretty satisfied with their prime ministers over the last two decades. But disapproval ratings inched upwards as time went on, until the prime minister either stepped aside or was forced aside by voters. In the chart below, the darker trend line refers to approval ratings. The lighter one represents disapproval ratings. Mulroney's numbers are the most dramatic. For almost the entirety of his time in office, more Canadians (often many more) disapproved of him than approved of him. But in 1988 his numbers surged just enough to secure re-election, before his ratings tumbled down once again. When Environics' polling starts, in June 1985, Mulroney was enjoying a post-election honeymoon with an approval rating of 61%. But that soon collapsed, to 43% in November, 34% in September 1986, and 23% in May 1987. From there, he started to rebound. By the end of 1987 he was back up to 28%. By the spring of 1988 he was at 34%, and in October 1988 he was at 36%. The following month, his party won re-election with 41% of the vote. And again Mulroney experienced a honeymoon, with his approval rating soaring to 60% in March 1989. It did not last long, falling to 45% in June of that year and 29% in December. But unlike his first term, Mulroney did not rebound. By the end of 1990, his approval rating was just 17%. By mid-1991, it was only 12% with an incredible 83% of Canadians saying they disapproved of the prime minister. It did not get much better until he stepped aside in June 1993, when his approval rating was 15%. Here we can see the roots of the disastrous showing of the Progressive Conservatives in 1993. The party's numbers did rebound under Kim Campbell, but in the end the party captured just about as much of the vote as the proportion of Canadians who approved of Mulroney when he stepped down. Overall, Mulroney averaged an approval rating of just 27% and a disapproval of 65% during his time in office. In his first term, his approval rating averaged 36%. In his second term, it was just 22%. Campbell was in office long enough for only one of Environics' polls, and it was a good one for her: 48% approval to 31% disapproval. But her party was drummed out of power in October 1993. Jean Chrétien took office, and had the same kind of numbers as Mulroney did when he won re-election in 1988: an approval rating of 62% and a disapproval rating of just 14% in December 1993. But Chrétien proved much more popular than Mulroney, and from the 1993 election to September 1995 his approval rating hovered at 61% or over, topping out at 66% in December 1994. His disapproval rating, however, increased: to 23% at the end of 1994 to 29% on the eve of the Quebec referendum. Though his side won that campaign, that it came so close to losing may have cost Chrétien. In December 1995, his approval rating was down to 53%, with disapproval jumping to 38%. His numbers would stick to this level for another year. For the first time as prime minister, Chrétien's approval rating dropped below 50% at the end of 1996 and in early 1997. It did not bode well for the 1997 election, and the Liberals just eked out another majority. Chrétien experienced another honeymoon at this point, with his approval rating rising above the 50% mark until it hit 61% in early 1998. It wobbled back and forth between 50% and 64% until early 2000, when it briefly fell to 36%. That was his lowest result ever. Perhaps it was anomalous, as his approval rating jumped back to 55% a few months later. By 2003, however, Chrétien's welcome was beginning to wear out. His approval rating fell to between 42% and 45% that year, as his disapproval rating reached majority status for only the second time during his tenure. He was gone by the end of the year. On average, Chrétien boasted some impressive numbers. During his entire time in office, he averaged an approval rating of 54%, against 37% disapproval. But here again we see that time takes its toll: his approval rating averaged 58% in his first term, 54% in his second, and 50% in his third. By then, his disapproval rating was averaging 46%, compared to 31% in his first term. Paul Martin improved upon Chrétien's numbers when he took over. His approval rating was 53% at the beginning of 2004, increasing to 56% by the summer. In 2005, however, his numbers began to sink. His approval rating was 48% at the beginning of that year, drooping to 41% in the spring (and disapproval jumping to 56%, higher than anything Chrétien managed). There was a small uptick over the summer of 2005, and it was time for another election. But in this case Martin would come up short. Over his short tenure, Martin averaged an approval rating of 49%, with disapproval at 46%. Stephen Harper, like Mulroney and Chrétien before him, enjoyed a honeymoon after winning the 2006 vote. His approval rating was 61% after that victory, with disapproval at just 27%. His approval ratings dropped to 53% by the end of the year, as his disapproval ratings shot up almost immediately, to 42%. Things held steady in 2007, with his approval rating hovering between 49% and 57%, with disapproval between 37% and 47%. But in 2008, Harper's approval rating dropped below 50%, and by the spring the country was split down the middle on the prime minister. By the end of 2008, his disapproval rating had hit a majority of respondents. Apart from an early 2009 poll (which saw Harper's numbers go back to 50% after winning the 2008 election), that is where the story ends. That is unfortunate, since it is useful to have these numbers coming from the same polling firm. The latest approval ratings from EKOS and Forum pegged Harper's approval rating to be around 36% which, aside from the anomalous Chrétien poll, would be the lowest by any prime minister since the Mulroney years. But we may be comparing apples to oranges here. It certainly fits into the trend of a gradual decline in fortunes the longer a prime minister stays in office. But that rate of decline differs. Over his three terms, Chrétien's approval ratings dropped by eight points. Over Mulroney's two, it fell (on average) by 14 points. From start to finish, though, Mulroney plummeted by 46 points, Chrétien by just 17. Martin was down by about 10 over some 18 months. So this chart may tell us little about what to expect going forward, but it does stand as an interesting historical document. A new poll suggests that the Conservatives have moved into the lead in national voting intentions, opening up a four-point edge over the Liberals. Is this poll a sign that the Conservatives are in the midst of a breakthrough as this election year begins, or is it an outlier poll that will soon be corrected by a regression towards the mean? And does the poll really put the Conservatives on the 'cusp of a majority'? 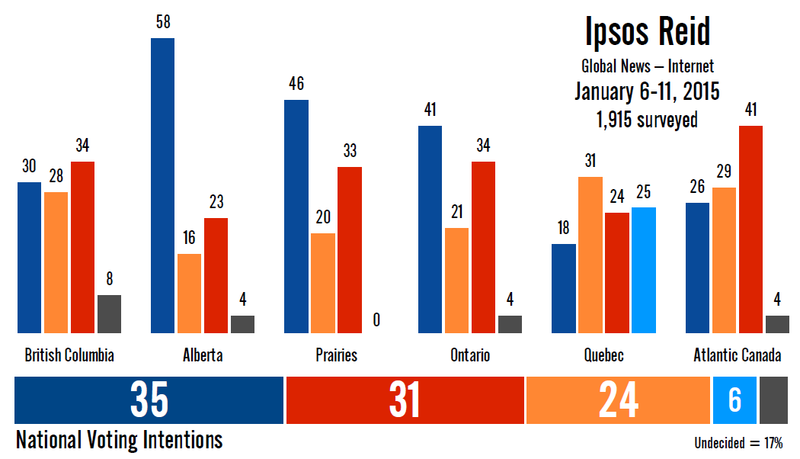 The poll in question was conducted by Ipsos Reid for Global News between January 6 and 11, interviewing 1,915 Canadians. The poll had an over-sample in Alberta (which would been corrected by weighting, of course), making the other regional samples more like a national poll of some 1,200 decided voters. The Conservatives led in the poll with 35%, a gain of two points over Ipsos's previous survey of November 10-December 1. That moved them ahead of the Liberals, who dropped three points to 31%. Only the decrease for the Liberals would be outside the margin of error of similarly sized probabilistic samples. But the Liberals have dropped in two consecutive Ipsos polls, from a high of 38% in September. The Conservatives have been trending upwards, up four points since then. The New Democrats have been very stable, unchanged at 24% (they have been at either 23% or 24% in Ipsos's last six surveys). The Bloc Québécois was up one point to 6%, while 4% supported other parties (including the Greens). The number of undecideds in the entire sample was 17%. Is this a potential outlier poll? The Conservatives have not registered 35% support in any poll since February 2013, two months before Justin Trudeau became Liberal leader. That was also the last time the party had a four-point lead (over the NDP in this case). The poll also had some surprising results on the gender split. It found the Conservatives ahead among men, at 37% to 33%, which is to be expected. But it also found the Conservatives five points ahead among women, with 34% to 29%. That is unusual. As my piece for the CBC explored this week, the Liberals have averaged a nine-point lead among women in polls done over the last month (and that was with an average lead of three points overall). Even if we do swing those averages by seven points to reflect Ipsos's overall lead, we still get nowhere close to a five-point advantage among women. And the Conservatives have traditionally not had such uniform support between the sexes. By my estimate, there was a 10-point discrepancy between Conservative support among men and women in the 2011 election. For the Liberals to score worse among women than among men is also contrary to virtually every poll done in recent memory. Ipsos did show a statistically significant drop in support among women, as the Liberals plummeted five points (and the Conservatives gained four) since their last survey. The score for the Bloc Québécois in Quebec is also noteworthy, as the party was placed in second with 25% support. That is their best performance in any poll since March of last year, some 50 polls ago. But there has been nothing whatsoever happening in Quebec that could explain such a boost. The only statistically significant regional shift occurred in Quebec, with the Liberals dropping eight points to 24% - explaining much of their national decrease. However, whenever a poll comes out that raises some eyebrows, the reaction should be caution and patience rather than skepticism. We'll have to wait and see if Ipsos is the first to capture something we need to keep an eye on. Certainly, the last few weeks have been tumultuous. What first looks like an outlier can be the first to capture a trend, like that CROP poll in the 2011 federal election that was the first to show the NDP in front in Quebec. And this is not the only poll to show the Conservatives in such a good position. 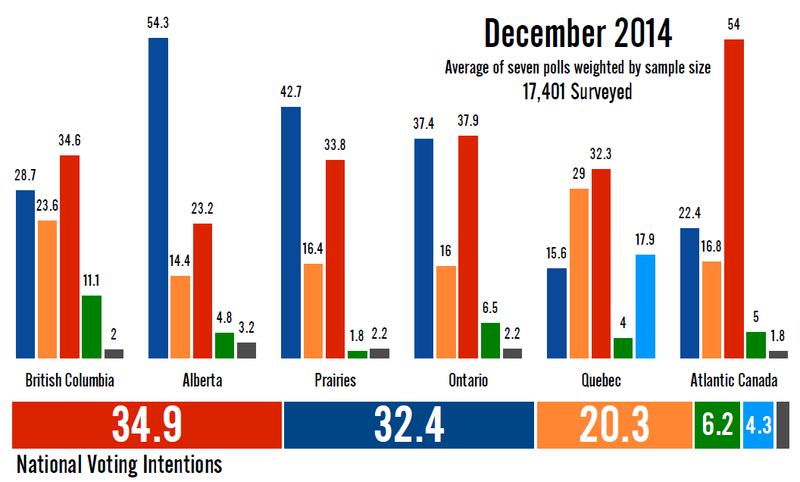 Angus Reid's mid-December poll put the Liberals and Conservatives in a tie at 34% apiece. Abacus Data's pre-Christmas poll put the Conservatives ahead by one point, with 34% to 33% support. In the context of those two surveys, a 35% to 31% split does not look unusual. The claim that it would put the Conservatives on the cusp of a majority government, as Ipsos Reid has made, is more unusual. Adding 30 seats to the electoral map does not change the math so drastically that the traditionally required 38% to 40% support for a majority government has suddenly been cut to just 35%. I recently looked at the thresholds required for a majority government, and the Conservative number still came in at 38%. By my reckoning, the Conservatives would instead win about 145 seats, falling 25 short of a majority government. It is difficult to see how the Conservatives could pull a majority out of these numbers when, for instance, they trail in British Columbia and are still down so much in Atlantic Canada. A swing of about 12 points in favour of the Liberals in Ontario, compared to the 2011 vote, cannot be compensated for by 15 seats (in regions the Liberals would expect to make most of their gains). The Liberals would win about 101 seats with these numbers, with the New Democrats taking 78 and the Bloc Québécois returning to official party status with 13 seats. They benefit greatly from vote splits, more than tripling their seat haul from 2011 despite a mere two-point gain in the popular vote. I don't think people should get carried away with the idea of an impending Conservative majority just yet, but the Ipsos poll does suggest the Conservatives could be en route to improving their re-election chances by leaps and bounds. The next polls will be revealing. The New Democrats received some bad news last week when Yvon Godin announced he would not be seeking re-election this year. Godin has represented the riding of Acadie-Bathurst, in northeastern New Brunswick, since 1997. Godin won the riding in 2011 with 69.7% of the vote. On the face of it, the New Democrats should have no concerns about retaining such a solidly NDP riding. But the question, which will only be answered when the next election is held, is just how much of a Godin riding Acadie-Bathurst has been. The riding was not always so safe for Godin. When he first won it in 1997, on the heels of anger of changes to employment insurance by the Liberal government, Godin took the riding with 41% of the vote to 35% for the incumbent Liberals. In 2000, the margin increased to seven points. But since 2004, the riding has been a very safe one. Only in 2006, when he took 49.9% of the vote, did Godin fail to secure a majority of ballots. In 2011, the Liberals - the traditional rival to the NDP in Acadie-Bathurst - dropped to just 14% support. The Conservatives finished second with 16%. However, Godin really was a game-changer in 1997. In the 1984, 1988, and 1993 federal elections (and recall that in the 1980s the NDP was at a historic high under Ed Broadbent), the NDP captured just 5% to 6% of the vote in Acadie-Bathurst. Falling that far may not be in the cards for the party now that Godin is gone, but the NDP is suffering in New Brunswick. There have been three large-sample (by New Brunswick standards) polls since November, which give us a good look at the political situation in the province. 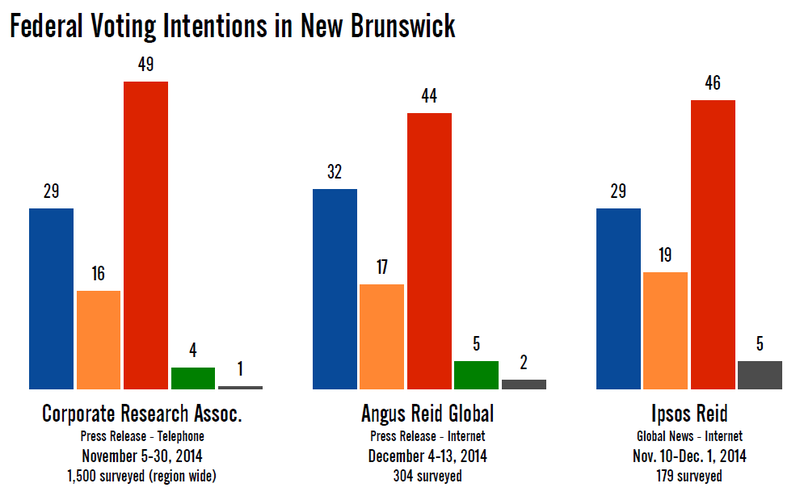 And the three polls (by CRA, Angus Reid, and Ipsos Reid) are all in close agreement. The Liberals were leading in New Brunswick in these polls with between 44% and 49% of the vote, representing a significant increase from the 22.6% the party captured in the 2011 election. The Conservatives were in second with between 29% and 32%, a big drop from the 43.9% the party had in 2011. The New Democrats have also dropped a great deal, from 29.8% in 2011 to between 16% and 19%. That sets them up for their worst performance in New Brunswick since the 2000 election. Between 2004 and 2008, the party had consistently captured 21% to 22% of the vote. If we average these three polls out, we end up with the Liberals at around 46%, the Conservatives at 30%, and the New Democrats at 17%. Under these circumstances, how good are the NDP's chances in Acadie-Bathurst? I've finished the projection model for the 2015 election, and I am just working on some final touches before launching in about two weeks. In the meantime, though, we can use it to take a closer look at what the polls are saying about what could happen in Acadie-Bathurst. 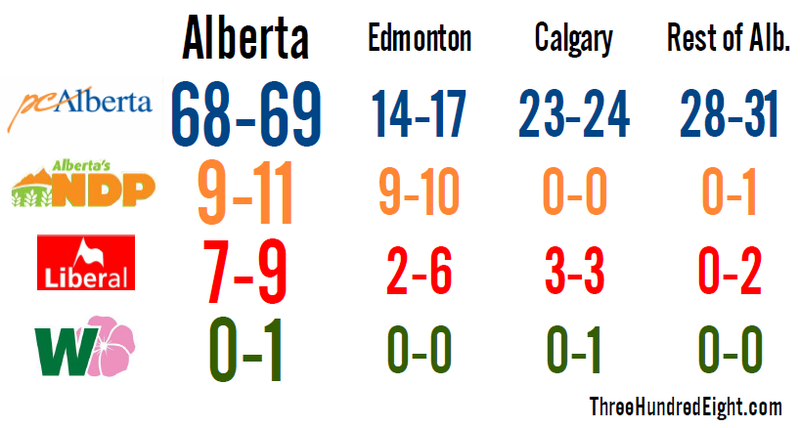 If we just go by the regional trends, which is what the model is designed to do, the riding should stay in NDP hands. The model gives the New Democrats between 44% and 50% of the vote without Godin on the ballot. The Liberals come in second with between 30% and 35%, while the Conservatives come in third with between 14% and 16%. With Godin, the NDP would have been projected to win more easily, with between 48% and 55% of the vote against 28% to 32% for the Liberals. But these New Brunswick polls suggest the race could be much closer, before we even take into consideration the drawing power of Godin. If we swing the model according to the three New Brunswick polls only, the NDP drops to between 42% and 48% and the Liberals to between 33% and 38%. While that still points to an NDP victory, that is a much closer margin. The 'minimum/maximum' projection would make Acadie-Bathurst, under these circumstances, a potential Liberal pick-up. Quantifying Godin's value is a much more difficult thing to do. If we look at the 1997 election when Godin first came along, the province-wide swing from 1993 to 1997 would have given the New Democrats about 22.4% of the vote in Acadie-Bathurst, rather than the 40.5% Godin actually captured. At the time, he was apparently worth about 20 points. If we use that as our guide, and penalize the departure of Godin by a factor of 0.55 rather than the normal 0.9 penalty assigned to departing incumbents, the model would give the NDP between 33% and 37% of the vote, with the Liberals between 37% and 43%. In other words, the riding becomes a toss-up that heavily leans towards the Liberals. Of course, that penalty is based on an election that occurred almost 18 years ago. But it does give an idea of the potential effect Godin's retirement will have on the results in Acadie-Bathurst. News reports did quote New Democrats recognizing that the formerly-secure riding is now one that will need to be fought over, so these calculations make some intuitive sense. The party's chances in Acadie-Bathurst would be improved if it can find a similarly popular candidate to take Godin's place. But the NDP would also benefit from a boost in the Atlantic region as a whole. At about 17%, where the polls have them now, the party is on track for their worst result since the 2000 election. Representatives of the riding of Skeena-Bulkley Valley have sat on the opposition benches for all but five of the last 58 years. Currently represented by NDP MP Nathan Cullen, the riding is tucked away in the northwestern corner of British Columbia, bordering Yukon and Alaska. It is a vast, sparsely populated riding. Every square kilometre has a mere 0.3 people in it. And they have reliably voted NDP for most of the last half century. This is the fifth riding the history of which I am profiling as part of the 2013 Kickstarter campaign. This riding was requested by backer Jonathan Van Barneveld, who generously contributed to the project that led to Tapping into the Pulse: Political public opinion polling in Canada, 2013. The ebook can be ordered here, or directly from Gumroad here and Amazon for your Kindle here. What is now Skeena-Bulkley Valley began as the riding of New Westminster in the new province of British Columbia in 1871. For the first two decades of its existence, the riding was mostly represented by Conservatives, though they only infrequently bothered to face the electorate. The riding's first MP was Hugh Nelson, an Irisman from County Antrim and a lumber merchant. He was elected as a Liberal-Conservative, the same party he represented in the provincial legislature from 1870 to 1871. "Mr. Nelson said the hon. 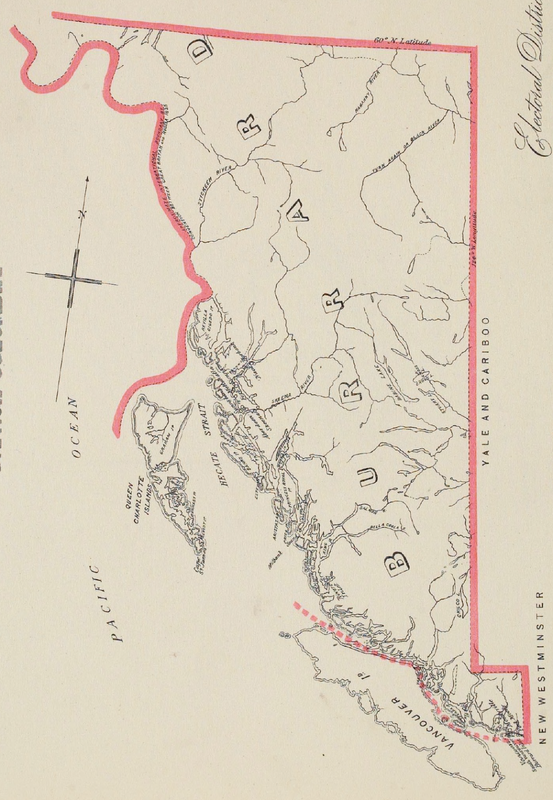 gentleman (Amor de Cosmos) had taken the ground that the railway was to terminate on the Pacific Coast, and that a terminus on the island waters between Vancouver's Island and the main land was not the Pacific Coast, and at the same time he advocated that the line should be taken to Victoria or Esquimalt." Nelson was acclaimed in the 1872 election, but he decided to leave politics after the Pacific Scandal had pushed John A. Macdonald, a man he supported, out of the top job. His loyalty would be rewarded in 1879, when he was named to the Senate. He would serve there until 1887, when he was named Lieutenant-Governor of British Columbia. "[Mills] said he had not very clearly heard the hon. gentleman. Were they to understand that he [Tilly] was favourable to asking Her Majesty to give the Government power to negotiate a treaty with the Sandwich Islands? If so, he was becoming a convert to the views of the Opposition. "Hon. Mr. Tilley remained silent. "Hon. Mr. Mackenzie: Surely we are to have an answer to this question. "Hon. Mr. Tilley gave no reply, and the motion was withdrawn." Nelson was replaced by another Irishman in 1874, when James Cunningham of the Liberals defeated the Conservative candidate by a slim margin. Cunningham resigned in 1878, however, but would be a Liberal MLA in British Columbia from 1884 to 1886. In 1878, Thomas McInnes, an independent, ran unopposed in the by-election. He was a coroner, physician, and surgeon born in Nova Scotia, a reeve in Dresden, Ontario in 1874 and mayor of New Westminster from 1876 to 1878. Having studied at Harvard University, McInnes had served in the Union Army during the American Civil War. In the general election held later that same year, McInnes was this time opposed by a candidate whose affiliation is unknown to the record books. McInnes was re-elected with 57% of the vote, but did not finish out his term. He was named to the Senate as an independent in 1881, serving until 1897 when he, too, was named Lieutenent-Governor of the province. A merchant named Joshua Homer was acclaimed in both the 1882 by-election and federal election as a Liberal-Conservative, but died in 1886. In the 1887 election, two Conservatives faced off against one another. Donald Chisholm, a teacher, prevailed with 69% of the vote. But he, too, would die in office in 1890 at the age of 68. G.E. Corbould was acclaimed in the by-election that followed, and secured re-election in 1891 with 76% of the vote against a Liberal candidate. By the 1896 election, the ridings had been re-drawn and the riding of Burrard was created, turning into Comox-Atlin in 1904 and finally Skeena in 1917. The change in boundaries was beneficial to the Liberals, who would hold the riding from 1896 until 1953 with the brief exceptions of the Robert Borden years (1911-1921) and single victories by the Tories in 1926 and the CCF in 1945. George Maxwell won the new riding of Burrard for the Liberals in 1896, as Wilfrid Laurier was swept to power nationwide. Maxwell, a Scottish Presbyterian minister was aided by two Conservatives being on the ballot. He won with 48% of the vote, improving that share to 57% in 1900. Maxwell died in office in 1902. In the 1903 by-election, an insurance executive named R.G. MacPherson retained the riding for the Liberals. An independent Liberal was his main opponent, taking 43% while McInnes, in a failed comeback attempt, took 8%. MacPherson did not run again in the riding of Comox-Atlin in 1904, choosing instead a successful bid for the riding of Vancouver City. 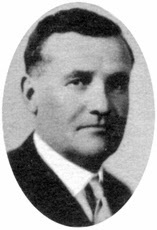 William Sloan, a businessman, was acclaimed, as he would be again in 1908. Perhaps having no mandate from the voters made it easier for Sloan to step aside for William Templeman in 1909 (he would eventually have a successful provincial career as an MLA from 1916 to 1928 and cabinet minister). Templeman was acclaimed that year. Templeman was the owner of the Victoria Daily Times (now part of the Times-Colonist), and a man who could not get himself elected. He first tried, and failed, in 1891. He lost two elections in 1896 and one in 1908. His only victory was a 1906 by-election win in Victoria City, and he did manage to get named to the Senate in 1897 by Laurier, holding the portfolios of Minister of Inland Revenue and Minister of Mines. In 1911, Templeman tried his luck in the riding of Victoria City again, and lost (again). In the first real vote held in Comox-Atlin since 1903, Herbert Clements of the Conservatives won with 53% of the vote, defeating Liberal Duncan Ross, a former MP for Yale-Cariboo. Clements had a political history already, but not in British Columbia: he had previously been the MP for Kent West in Ontario before meeting defeat in 1908. War broke out in 1914, and when the 1917 election came around Clements ran in the new riding of Comox-Alberni, as the new riding of Skeena had been carved out of the electoral map. Cyrus Peck won Skeena in the riding's first election, taking 57% of the vote for the Conservatives. Peck was a war hero, a captain in the 30th Battalion who shipped out to Europe in February 1915. He would rise to the rank of Lieutenant-Colonel with the 16th Battalion of the Canadian Scottish Regiment, and served on the Western Front. He was awarded the Distinguished Service Order and Bar in 1917, having "personally led his men in an attack on nests of machine guns protecting the enemy's guns, which he captured." He was awarded the Victoria Cross, the British Empire's top honour, in 1918, "for most conspicuous bravery and skilful leading when in attack under intense fire." But the residents in Skeena were not overawed, and in 1921 Peck was defeated by Liberal Alfred Stork, who had been his opponent in 1917. The vote was close, though, with Stork taking 50.3% to Peck's 49.7%. Stork was a merchant, as well as the mayor of Fernie in 1904 and Prince Rupert in 1910. He secure re-elected in 1925, even though a Progressive candidate captured 10% of the vote. His luck ran out in 1926, however, when James Brady of the Conservatives won with 52%. Brady was from Ireland, and a school principal. The riding returned to form in 1930 when Brady was defeated by Olof Hanson, a Swedish lumberman. Hanson took 55% of the vote for the Liberals, his best showing over three elections. He would win again in 1935 (a Reconstruction candidate took 21% of the vote) and 1940. That was the first election in which the CCF ran a candidate here, the party taking 30% and displacing the Conservatives as the second choice. The CCF rode that momentum to victory in 1945, when Hanson opted not to run for re-election. Harry Archibald, a young member of the Royal Canadian Air Force, won with 37% of the vote, as 13% went to the Labour-Progressive Party, the vehicle for Canada's communists at the time. Archibald met defeat in 1949, however, when Edward Applewhaite of the Liberals took 58% of the vote in a direct face-off between the Liberals and CCF (the Tories did not run a candidate). 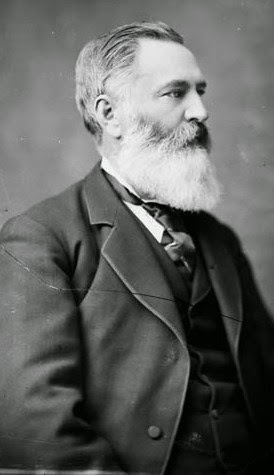 Applewhaite, a life insurance agent, was the first MP for the riding to actually be born in British Columbia. His great-granddaughter was Deborah Gray, who would later win a 1989 by-election for the Reform Party. Applewhaite was re-elected in 1953, as a Social Credit candidate captured 24% of the vote to finish third. The election was notable for the candidacy of Ann Minard, a housewife, for the Labour-Progressives. She was the riding's first female candidate, and she took 3% of the vote. In the 1957 election, when the Liberals finally met defeat at the hands of John Diefenbaker of the Progressive Conservatives, Skeena began its long history with the CCF/NDP. The party would hold the riding virtually uncontested until 1974, before winning it again by comfortable margins between 1979 and 1988. Applewhaite was defeated in 1957, as Frank Howard of the CCF took 39% of the vote (the PCs, after sitting out the previous two votes, captured 25% of the vote, the Liberals 36%). Howard was a trade unionist out of the logging industry and former BC CCF MLA. He had a rough past, having been convicted for armed robbery at the age of 18 (the biography he would later write was called From Prison to Parliament). Howard would secure re-election six times, representing the riding from 1957 until 1974. He routinely won with a majority of the vote when he ran under the NDP, topping out at 60% in 1962. His vote share slowly dropped from there, however, until it fell below the 50% mark in 1972 and finally put him in second place in 1974. Before then, he saw off the Liberals, who fell to between 22% and 33% of the vote for much of his tenure (the Tories were hardly a factor). In 1972, Howard ran for the leadership of the NDP after the departure of Tommy Douglas. He would finish fifth and last on the first ballot with 7%. David Lewis would eventual emerge as the party's new leader. In 1974, Howard finally met defeat (he would continue his political career as an NDP MLA from 1979 to 1985). The Liberals' Iona Campagnolo won with 40% of the vote, and she was the riding's first (and only) female MP. She also made history as the first female president of a federal party in 1982 and Lieutenant-Governor of B.C. in 2001. An Order of Canada recipient, Campagnolo served as Parliamentary Secretary to the Minister of Indian Affairs and Northern Development from 1974, and later as Minister of State (Fitness and Amateur Sport) in 1976 in Pierre Trudeau's government. But Campagnolo was only a brief Liberal interlude for Skeena, as the NDP won the riding again in 1979 when Jim Fulton, a probation officer, took it with 42% of the vote to 40% for Campagnolo. Fulton would win three more times, pushing his vote up to 53% in 1988, as the Liberals fell to third place behind the Tories during the Mulroney years. When the NDP's vote collapsed in 1993, Skeena was not spared. The NDP fell to third place behind the Liberals in two of the next three elections, as Preston Manning's Reform Party surged in rural British Columbia. Only when the right was merged in 2004 did Skeena go back to its NDP roots. In that momentous 1993 election, Fulton opted not to run again and the NDP's vote collapsed to just 21%, its worst ever performance in the riding. Mike Scott of the Reform Party prevailed with 38%, as the Liberals moved into second with 24% and the Tories plummeted to just 7% support. That put them behind the National Party, which captured 8% of the vote here. Scott was re-elected in 1997 with 42% of the vote, as the NDP vote rebounded to 31% with Isaac Sobol, the former National Party candidate, on the ballot. The PC dropped to just 4%, and would fall further to 3% in 2000. In that election, Andy Burton, who served as mayor of Stewart for six years, ran in Scott's place for the Canadian Alliance, winning with 43% of the vote. Though the newly merged Conservative Party would be the main competitor to the NDP now in Skeena-Bulkley Valley, the New Democrats under Jack Layton had recovered from the lows of the 1990s. Nathan Cullen, a young HR consultant from Ontario (though he moved to B.C. in 1998), would represent the riding for the next decade. In 2004, Burton tried to hold onto his riding as a Conservative, but was defeated by the NDP's Cullen. He took 37% of the vote against Burton's 34%, as the Liberals slipped to 22% in the riding. In 2006, the Liberal vote slumped further to just 13% as Cullen surged to 48% in the riding, holding off a comeback attempt by Scott. Cullen would win again in 2008 with 50% and in 2011 with 55%, as the Liberals fell to just 4% support. One interesting tidbit about Skeena-Bulkley Valley is the presence of Rod Taylor. He has been the Christian Heritage Party candidate in each of the last four elections, and will lead the party in 2015. The CHP has interestingly done relatively well here, first taking 3.6% of the vote in 1988. Taylor has garnered 3.8%, 3.2%, 3.3%, and 3% support respectively in the elections held since 2004. A footnote, of course, but something about Skeena-Bulkley Valley that sets it apart from many other ridings. Skeena-Bulkley Valley is a riding the New Democrats can count on. Cullen is a popular MP (he finished third in the leadership race in 2012, with 25% support on the third ballot). The Conservatives have been stuck at between 33% and 36% in the last four elections, despite a consistently increasing vote share nationwide. The Liberals will likely see a boost but have no base from which to build upon. For the foreseeable future, the northwestern corner of British Columbia is likely to remain painted in orange. Last month was the busiest December in federal polling since 2010, with six national and one Quebec-only poll surveying some 17,000 Canadians being conducted. The results show the Liberals holding on to the lead for the 21st consecutive month, the Conservatives closing the gap, and the NDP suffering one of its worst months since before the 2011 federal election. The Liberals averaged 34.9% support in December, a gain of 0.2 points over their performance in November. The Conservatives picked up 0.4 points and averaged 32.4%, maintaining their highest levels of support since February 2013. The New Democrats, however, dropped 1.4 points to 20.3%, their lowest level since March 2011. The Greens were up 0.2 points to 6.2% (the party has been at 6% for three consecutive months now), while the Bloc Québécois was at 4.3%. Another 2% of Canadians said they would vote for another party. Considering that the biggest shift was worth only 1.4 points, December appears to have been a month of stability. But the aggregate masks the underlying numbers. In November, the Liberals were polled at between 34% and 36%, the Conservatives between 30% and 33%, and the NDP between 18% and 24%. Apart from the wider range for the New Democrats, this is a group of polls all saying the same thing. December, however, has been much more volatile, with the Liberals between 32% and 41%, the Conservatives between 31% and 34%, and the NDP between 17% and 24%. The Conservative range was still tight, but the NDP's range grew a little and the Liberal range grew a lot, pointing towards anything from a big lead to a second-place finish. We should keep this in mind: while the aggregate suggests a stable trend line, the individual polls published in December are far less clear. The Liberals led in British Columbia with 34.6%, a gain of 2.5 points since November. The Conservatives were down 3.4 points to 28.7%, while the NDP was unchanged at 23.6% support. The Greens were up 0.9 points to 11.1%. In Alberta, the Conservatives dropped 3.2 points but still led with 54.3%. The Liberals halted four months of decline with a gain of 2.3 points to hit 23.2%. The NDP was up 0.3 points to 14.4%, while the Greens were down 0.6 points to 4.8%. The Conservatives were also in front in the Prairies, picking up 3.4 points to lead with 42.7%. That is their best showing since June. The Liberals had their best result since November 2013, picking up 1.6 points to reach 33.8%. The NDP, however, was down 3.1 points to just 16.4%, their lowest result in Saskatchewan and Manitoba since February 2009. The Greens were down 3.1 points to 4.8%. Ontario is the closest race in the country, with the Liberals narrowly ahead with 37.9% support in December against 37.4% for the Conservatives. That represented a drop of 0.2 points for the Liberals and a gain of 1.7 points for the Conservatives, their best since January 2013 and the third consecutive month of increase for the party. The NDP was down 2.9 points to 16%, their worst since February 2011, while the Greens were up 1.2 points to 6.5%. In Quebec, the Liberals were up 0.1 point to 32.3%, while the NDP was down 0.7 points to 29%. The Bloc Québécois picked up one point and averaged 17.9%, its best result since July. The Conservatives were down 0.7 points to 15.6%, while the Greens were down 0.1 point to 4%. In Atlantic Canada, the Liberals were up 1.6 points to 54%, their best result since May, while the Conservatives were down 1.9 points to 22.4%. The NDP fell 2.3 points to 16.8% in the region, their lowest level of support since before 2009. The Greens were up 1.1 points to 5%. With these levels of support, the Conservatives would likely win 139 seats, with 130 going to the Liberals and 65 to the New Democrats. The Greens and Bloc would each win two seats. Since November, this represents a gain of six seats for the Conservatives, two for the Liberals, and one for the Bloc, with the NDP dropping nine. The Conservatives picked up nine seats in Ontario and one in the Prairies, but dropped one in both Alberta and Atlantic Canada and two in British Columbia. The Liberals gained two seats in Quebec and one each in the north, Alberta, and Atlantic Canada, but dropped three in Ontario. The NDP dropped six seats in Ontario, three in Quebec, and one in the Prairies, but gained two in British Columbia. So it remains a close race between the Liberals and Conservatives, all the more so in the context of who would come out ahead in the seat count. But it was a bad month for the New Democrats, who were below 17% in every region except Quebec and British Columbia. Normally, one would expect lower NDP numbers to benefit the Liberals, but it hasn't worked out that way (the Liberals' widest lead in 2014 came when the NDP was at 22%, in 2013 it was when the party was at 23%). Perhaps the Liberals are picking up a lot of support from the NDP that is making up for the voters they have lost to the Conservatives, or perhaps some New Democrats are moving over to the Tories. No matter what is going on, it appears that low NDP numbers are not necessarily a boon to the Liberals.